I have been hosting songwriting retreats for 26 years, this year was a time of great reflection as I stood surrounded by massive talent and love. The retreats started down in Devon at Huntsham Court, a big old pile run by two lovely nutty people, they had to be to house so many lose cannons. We wrote dozens of great songs there, with wonderful writers like Kirsty McColl and Lamont Dozier, Chris Braide and Graham Gouldman, Cathy Dennis Suggs and Rick Astley. When I used to co write at these events I once penned ‘Cowboys are my Weakness’ with Gary Clark, and ‘Playing with Electric Trains’ with Francis Dunnery. Huntsham was a holster with a loaded gun. On one of the weeks I had the good fortune of having Rick Wright join us from Pink Floyd, it was a very inspired week as they all are. Rick and I walked on the moors and shared band stories, and there are many. I loved being in Devon at Huntsham it was such a special place, all falling apart but kept together by the songs floating with the dust in mid air. Some heavy nights at the bar, followed more heavy nights at the bar, what was not to like. We moved on from Devon to Italy and the insanely wonderful Monestevole, a monastery on a mountain side, and then on to Wales and the home of Dylan Thomas on the marsh. We then pitched tents closer to home in Kent at the massive oddity that is Oxen Hoath. Chris Sheehan, Matt Deighton, Amy Wadge and Kathryn Williams to mention just a few of the old hands on deck during those flossy years. These years in the middle were inspired but it was hard to find home in the places we went to, except for Italy, where I would live in a heartbeat. The food, the lovely people who looked after us and the journey there and back will always be part of my happiest memory. Driving with young Melvin Duffy in my Jag, being followed by the song meister Marti Pellow in his silver Merc, that 15 hour journey I miss very much, down through Europe in all of its summer glory. Hairy stuff. A lovely chap called Adam Levy came to most of these middle years, what a lovely fella with a massive heart of gold. I wrote a nice song with Adam and Geoff Martyn called ‘The Party is Over’, Many great songs came from Italy, as well as a few fond memories walking and talking in the sunsets with pizza ice cream and friends. 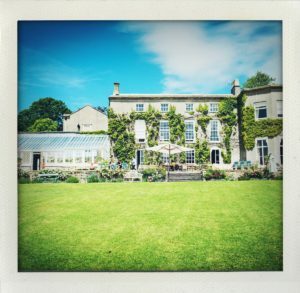 Most recently the writers weeks have been held in Somerset at Pennard House, the most embracing of all venues with such lovely people at the helm to look after us all. And by saying all I mean 36 in total this year alone. Harry his mother Suzie, wife Gee and the skittle hungry staff are our family. Most of the thanks must go to Peter Bradley and his father for supporting these weeks with donations from the Buddy Holly Foundation, it really is magical of them to support songwriting in this way. Buddy would be so proud of them. From America recently we have welcomed Gary Burr, Beth Neilson Chapman, Kimmie Rhodes and Sara Dougal, so impressive so adorable as people. Mark Nevin and Gregor Philip are regular fellows of Pennard, as are Nell Brydon and Judy Ztuke our team is growing all the time. How does it work? its simple. Each morning I place a list on the Grandfather Clock in the hall, groups mostly of three, everyone hovers around the list at 10am to see who they are placed with, and off they go into work rooms dotted around the house and grounds. Lunch is at 1pm then they plough on until the evening and the performance. Everyone plays the newly born songs in the coach house. Each group get up in turn to play and sing their songs of the day, at this point I watch and listen absorbed by the amazing talents. This year the songs reached a new level, a peak was reached. Later in the week a performance is held in the church at the end of the garden. Wow, its amazing to witness and be a small part of. This year I was taken aback by a whimsical song written about me and my part in the week, but its not about me or the songs written its about the friendships formed for the future. I drove home from Glastonbury in silence after the show, I was filled up with so many emotions. Its been a long time, 26 years. In the last five years things have certainly been kicked up a gear with the solid backroom love from Trudie, Marc and Miles Myerscough-Harris, who bring cameras footballs and a sense of order to the week. Trudie brings Bob Harris with her for support, her hubby and all round whispering wonder boy. Each day is documented on film and on memory stick by the said Miles who is a genius. I feel very supported by this new team in my life, they are as important as the songs. The songs are unborn in the mornings, and by the end of the day they are on the teat of each writer, displayed for us all to hear as a collective group, but not without the backup. Its like rehab, but without the anger and fear. Next stop is Lafayette in America, followed by Lubbock Texas with a few UK retreats thrown in for fun along the way in 2019. The train is right on track. There are so many names not on this page but they know who they are and without them this would not be a reality, and I love and thank them all for being there. I hope to find demos and songs covered from the weeks for a playlist so everyone can hear the love. It may take awhile so be patient. Over 26 years there must have been over 200 writers, and from that breed maybe 1500 songs, thats a lot of middle eights! Not all of them cut the mustard but its not really about that, its about the cream that rises to the top. Songwriting sometimes feels like a dyeing art, unless you are very lucky and manage a few hits with Kyle or on the country cuffs, its mainly a peculation of expression. Thats why these weeks are so exciting to me, to capture the moment and find common ground with like minded people is a real lift. I never get enough time to write these days as to stand still is not possible, I have to throw so much mud at the walls to keep this ship afloat. Back in the days of Huntsham there was little to distract me, and therefore time was not an issue I could just sit and sink into an empty page for a few hours here and there, it was like swimming in rivers which seemed full of inspiration. If I won the lottery I would find my way back to those days, and just sit, to be, to find my way in the world of my often idling imagination. Hearing the songs from this week in the church made me realise there is so much to do, so much to catch up with. I have time to find myself in that way so im not concerned, as that person is within me and within me is the best and safest place to be, for now. In loving memory of the birds that flew away. Howard New, Matthew Jay, Kirsty McColl, Colin Vearncombe and Christophe Edwards.